Football, Baseball, Soccer, Basketball, Tennis, Badminton, Ping Pong, Hacky Sack, and Track and Field. An awesome 3D soccer game with intuitive controls and responsive gameplay. Select your team and play the world. Score a combined total points in three dives by flipping and performing moves. Each dive is 5m higher for more air time. Draw your own custom track to drive a number of different vehicles over to collect goals and perform stunts and tricks. Compete in the 100 meter dash races to make it to the Olympic level. Press the arrow keys as fast as you can to run. Launch the stickman as far as possible. Gain points based on distance, height, style, and tricks. Compete in the world cup championships with your favorite football players in this sports game. Just in time for the Superbowl, we are proud to present Quarterback Challenge. Embark on an exciting football career. You can also play arcade mode to just play soccer, or practice. Score goals and win the match against football/soccer players in this sports game. Attempt different challenges. Compete for the most points in one jump by customizing your shopping cart and performing mid-air tricks. Attempt to make a penguin fly by using a combination of rockets and hand gliders. 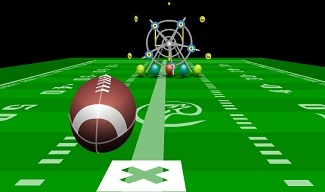 Compete for the Crunch Ball championship in this great team-based sports game. Launch the ragdoll goalkeeper towards the spinning soccer ball as it approaches the net to make the save. Keep the hack in the air using your feet, legs, and head while performing tricks and combinations to score points. A cross between bumper cars and air hockey, this two-player game is alot of fun against the computer or a friend. Nicely made 3-point basketball shooter. Take shots from various positions on the court in this fun basketball flash game. A fun ping pong game with easy controls. The game gets progressively faster with each consecutive hit. Use aiming and timing techniques to hit the baseball in the right direction to destroy as many objects as possible. Test your air hockey skills in this challenging competition game. Beat all the players in each country. Ski through each level with the time allotted while flying off hills and ramps, attempting to perform tricks and combo's. Fun, fast and the simple controls make it great to play against a friend.. Compete for hi-scores in the traditional home run derby or points challenge. 2D golf game with accurate physics and interesting power ups. Play 18 holes while avoiding sand, water traps. Fly through the air in a suped-up shopping cart. Earn points to upgrade your cart with rocket engines, tricks, more. Single player Christmas themed bowling game. High scores are recorded online. Track And Field Challenge. Attempt to run as fast as you can in the 100m sprint olympic flash games. Track And Field Challenge. Attempt to vault over the high bar in this olympic style flash game. Track And Field Challenge. Attempt to run fast and time your jumps in the 110m hurdles olympic flash games. Track And Field Challenge. Run fast and time your launch to compete in this olympic style long jump game. Play through 18 holes while avoiding trees, rocks, and water hazards. Control your player by moving your mouse around the court. Hold down the mouse button to increase your shot power. Dog training and racing sports simulation game. Attempt to make the most money over a 20-week dog-racing course.